The table below gives the actual height for each mount, measured from the top of the action to the underside of the scope tube. This height is commonly known as BH* and is very useful when calculating the height required for a scope mount. To calculate the required mount height, measure the diameter of the objective lens of your scope and divide by 2 to give you the radius. If your scope has a 56mm objective lens, the actual measured diameter of the objective lens is probably around 64mm. Divide this by 2 gives a radius of 32mm. Take away the radius of your scope tube, which is 15mm if the scope has a 30mm tube. This	leaves a height to clear the action of 17mm. However, most scopes sit forward of the action and over the barrel. The barrel on most hunting rifles will be lower than the top of the action so this reduces the height of the mount. Place a straight edge on top of the action projecting forward over the barrel. 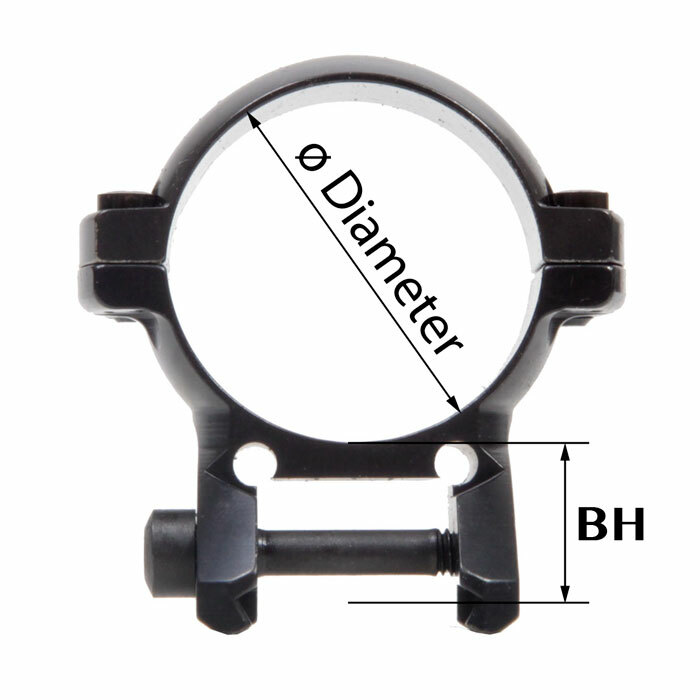 Measure from the underside of the straight edge down to the barrel at the point where the objective lens will reach. Take this measurement away from the height you already have and add 1mm to ensure the objective lens does not actually touch the barrel. For example, the difference between the top of the action and the barrel is 5mm. You already calculated the height above the action as 17mm so you take 5 away, leaving 12mm. Add 1mm for clearance and you need a mount height of 13mm. From the table above you can see that the 30mm Med High is exactly 13mm. If you have lens covers mounted on your scope remember to include this when measuring the diameter of the objective lens. If you change your scope from Summer position to Winter, your scope will sit further back over the thicker part of the barrel and this will reduce the clearance under the objective lens. For this reason, it is recommended that all measurements are taken assuming the scope will be in the rear Winter position.